Spice up your Thanksgiving and Christmas season with some extra special libations! Mix up some Mulled Wine, Spiced Cider, Hot Toddies or Hot Buttered Rum for some seasonal warmth that will leave your toes a tinglin'. Now all you need is a smoking jacket, a wing-back and a guy named Jeeves to serve you. Mulled Wine is Jack Frost's answer to sangria. Wine gets a richer, warmer tone with spices, fall fruits and a bit of brown sugar. Combine wines, orange juice and zest, ginger, cinnamon sticks, and cloves into large pot. Turn burner to low and slowly add sugar. Stir til completely dissolved. Cover and heat over medium-low for at least an hour. Strain and serve with a splash of Grand Marnier or brandy, if desired. Cozy and comforting, a great spiced cider is the perfect libation for curling up with a good book by a snowy window. Poke cloves into the skin of the orange to create a pomander. Slice orange into wedges. 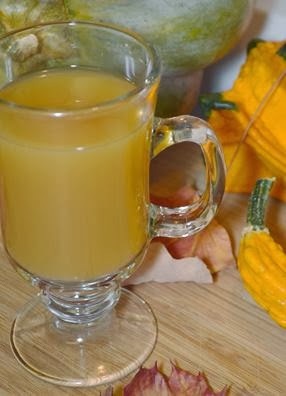 Combine Cider, orange wedges, cloves, cinnamon sticks and spice in pot. Heat on low, stirring frequently for 10-15 minutes (NOTE: Cider will separate if allowed to boil). Remove from heat. Add rum, and serve. It's hot. It's buttered. It's rum. I mean, what's not to love? With a mixer, cream together butter, brown sugar, spice, vanilla and salt. Place in fridge for 15 minutes to harden slightly. Scoop 1 Tbsp butter into each of 6 glasses. Pour 2-3 oz rum over butter. Fill the rest of the glass with hot water. Add orange slice to the rim and serve. A Hot Toddy is the winter drink equivalent to a good kick in the uprights. It's strong, hot and might just leave you saying "Wowza!" Coat the bottom of a glass with honey. Add whiskey or bourbon, lemon juice and tea bag. Fill the rest of the glass with hot water and a splash of ginger liqueur. Allow to steep for 2-3 minutes. I'll take one of each, please! Yumm!! Thank you for helping select the beverage of choice at Thanksgiving this year!